OCEAN CARGO logistics professional, with eight years’ experience,” Martin Cate’s résumé might have read if he had written one. But Cate figured his “personal interests” might be a stronger suit for the type of interview he was going for. He had decided he needed a career change and at Trader Vic’s in San Francisco he merely slid a photo of his home tiki bar across the bar. He was hired on the spot – you’re either a tiki guy or you’re not. Cate is certainly that. Indeed, he recently penned a book on the ‘cult of tiki’. “It’s more than drinks,” he says. “It’s a pop-art movement that took over America for 45 years. It’s easy to forget because so much was torn down and destroyed, but tiki was everywhere.” If anyone is responsible for its modern-day renaissance, Cate’s face is pretty high up the totem. 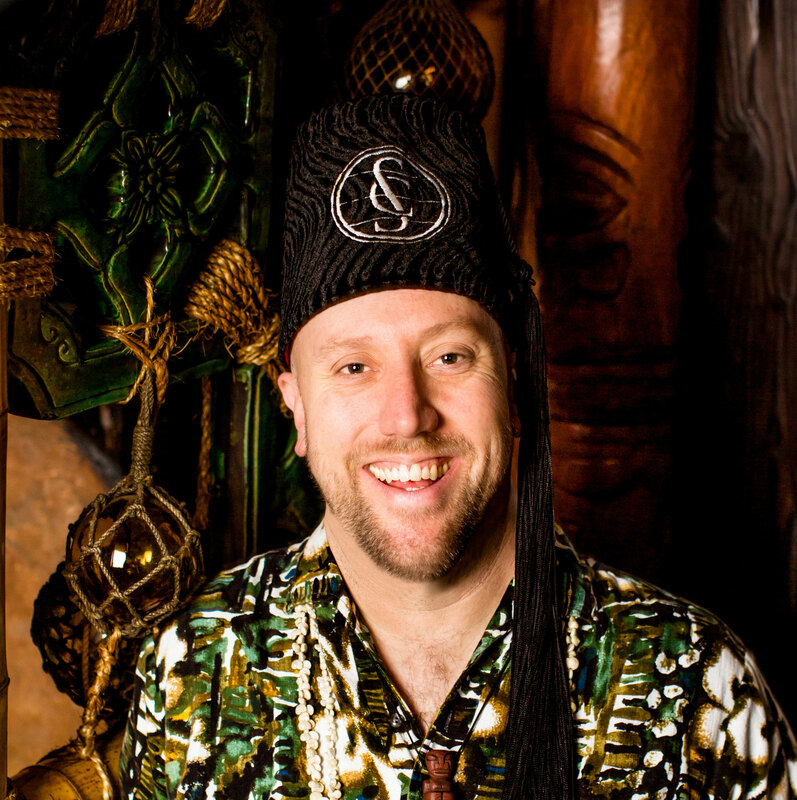 He is always in tropical shirt, the fez he is wearing in this picture, though, is harder to explain – other than to say anyone who has drunk 100 different rums in his bar, Smuggler’s Cove, gets one. But not a black one – even a fraternity of fez-wearing rum enthusiasts needs a leader. “The fez and I go way back,” Cate says. Back to 2009 in fact, when his now world-famous bar opened. By 2011 Smuggler’s Cove was in The World’s 50 Best Bars list. That sounds simple, but it wasn’t. Cate foraged, collected and grafted to execute his concept which, once manifested, looked something like a flotsam of smugglers’ and pirates’ wares festooned across ground and basement floors (and much of their ceilings), plus a tiki-themed mezzanine. Most tiki bars at the time were fading into dingy museums of a once-bright culture, but Smuggler’s was a new spin on the format. And, crucially, it took drinks and hospitality seriously. By late 2015 Cate was ready for a sequel. Once he had his concept he dive-bombed in like a dad at a hotel swimming pool. This time the concept was a disused London tube station from the 1890s, majoring on gin and English food. Whitechapel is the kind of place that needs someone who knows his way around trinkets and memorabilia. But, despite the plunge into new waters, Cate is still a rum and tiki guy. “I’m in a committed, passionate relationship with rum and I’m having a sultry affair with gin,” he says.